Lately we’ve received a ton of questions about our rugs. How we find them. What materials and designs we like best. How to clean and care for them so they last. Even what price points we aim for (and run away from). The truth is that rugs are complicated. And they can be expensive. And they’re definitely one of those easier-than-average things you can get “wrong.” And not only does that make you feel all crestfallen and dejected, then you’re even more scared to take the rug-buying leap again. And so begins the downward rug spiral. Oh, the drama! But fear not! As two people who have pretty much made all of the rug-buying mistakes that someone can make over the last ten years of homeownership (too small, too cheap, too trendy, wrong materials, etc) we’re here to help anyone who is currently aboard the Rugs-R-Hard Express (for the purposes of this metaphor, imagine riding a cute little train full of rugs that are good and bad and feeling a whole lotta indecision while we stand there with you while wearing adorable overalls and conductor hats and holding a paper bag for you to breathe into). All aboard! We like big rugs and we cannot lie. That’s because generally speaking: the bigger the better when it comes to rugs. 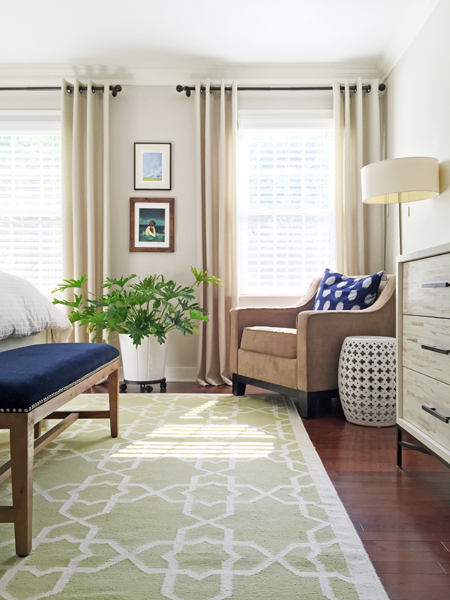 You obviously don’t want anything that hits the baseboards because it’s too oversized, but a nice generously-sized rug can make a room feel expansive and welcoming (while a too-tiny rug can make a space feel smaller and choppier). 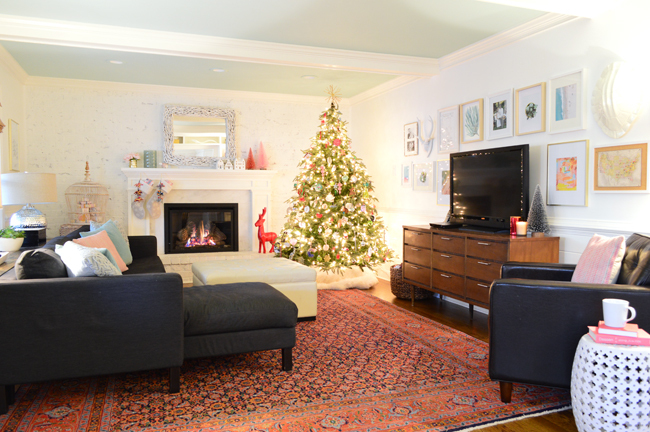 In most cases, you can almost go wall-to-wall with your rug – just leaving a foot or two of border around each edge. For example, this 10 x 14″ green rug fills our 13.5 x 18″ bedroom nicely, adds some softness and pattern, and generally makes the room feel more polished and complete. 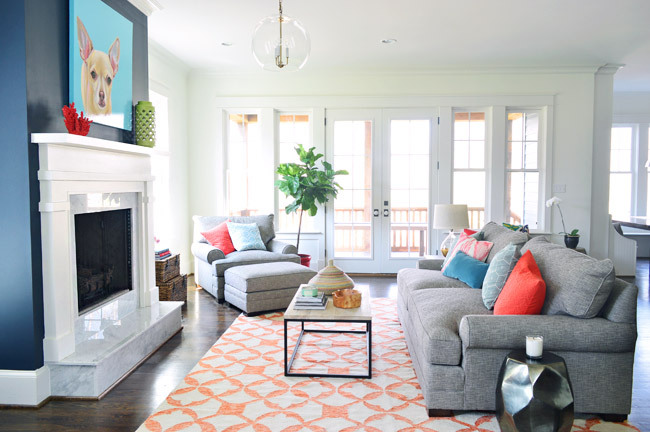 But in large rooms or open-concept spaces, a rug that big might be impractical for the space (or your wallet) – so the other way to determine size is to make sure your rug serves to “connect” the furniture in the room while helping you define a functional area. For instance, the living room in our showhouse opened to the kitchen, so we used this 9 x 12″ rug to help define the seating area, making sure the couch, chair, and tables all felt connected to it and grounded by it. In an open floor plan, large area rugs can be the key to visually delineating different zones and helping the furniture to feel like it’s planted in a certain area, instead of floating listlessly in a large space. While we’ve used plenty of solid-colored rugs in the past, we have learned over time that we generally like rugs with a pattern. Obviously, pattern can add some visual interest to a room, but we also love that it helps hide wear (and the cookie crumbs and paper clippings that happen with two kids and a dog). 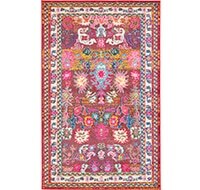 For instance, over the past few years we’ve hunted down three large traditional Persian and Turkish rugs for three high-traffic areas in our house (our living room, bonus room, and dining room). Why? Because the intricate patterns and deep colors are incredibly forgiving, and we also find them visually interesting and pretty. In short: they’re like the jackpot of rugs for us. Although you might worry their color and pattern would be too demanding, they almost act as a neutral in our house, just due to the fact that they can layer in almost anywhere. In fact, we’re sure we could swap out this bonus room rug for the one in our bedroom and it would work just as well in there. 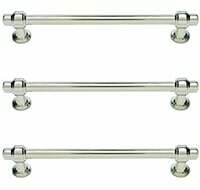 Just beware of using them right next to a heavily patterned sofa or curtains. Much like figuring out your favorite wardrobe staples (mine would be black everything, big earrings, and BLAZERS!!! 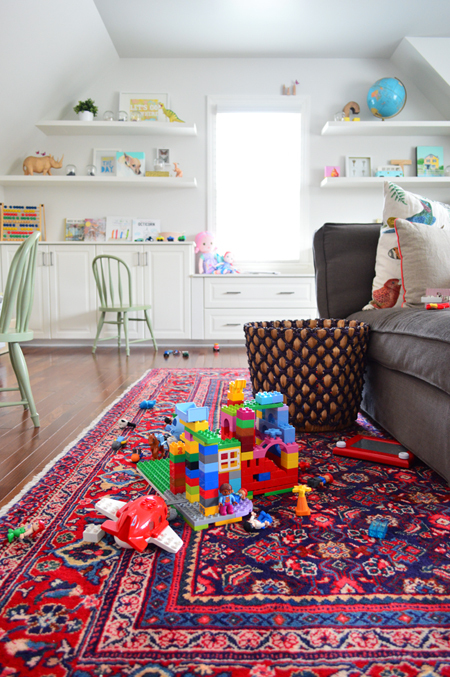 ), figuring out the rugs you love most can be awesome – especially if they work well for your family and your lifestyle. So if you realize that there’s a certain type of rug design and tone that’s forgiving for your family/lifestyle/crumb sitch…. go for it! Second to our love of traditional rugs are smaller-scale geometric patterned ones (for similar wear-hiding reasons). 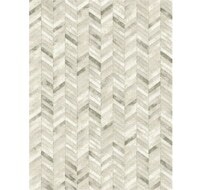 The tighter or more varied the pattern, the better it will be at disguising crumbs or whatever else lurks in your rugs. 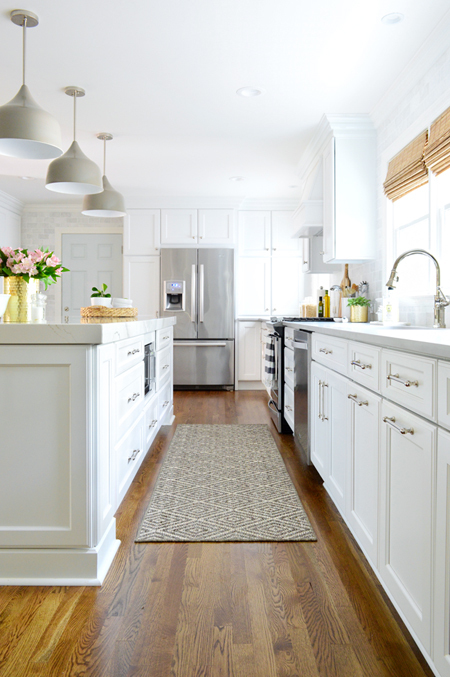 For instance, in our first and second kitchens we had light-colored subtly patterned rugs, which both started to look dingy and dirty over time, just from random cooking splatters or dusty footprints. They were also pretty cheap/low quality, which didn’t help either. Meanwhile, the kitchen runner that we have now is still neutral, but it has a high-contrast diamond pattern that’s a lot tighter in scale (which is definitely more forgiving) and it’s made from higher-quality sisal, which can be hosed off and dried outside in the sun. But more on materials in a minute. Whether we’re shopping for a tradition or geometric pattern, we typically aim for an all-over, repeating pattern that’s small-to-medium in scale. You know, nothing with a big medallion in the center or a giant high-contrast repeating design. We’ve owned a rug with a large, asymmetrical graphic across it before, but typically find those harder to work with because they can become too visually demanding and may be harder to orient furniture around. Plus, the design may be less timeless than a more classic pattern. 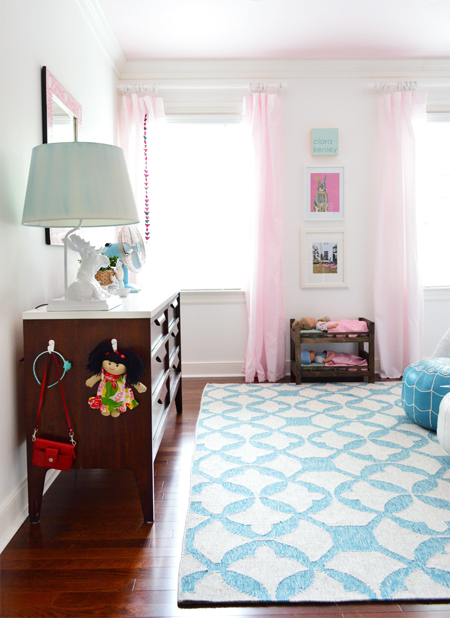 By comparison, we’ve had this lower-contrast trellis inspired rug for over five years without any signs of tiring of it. But with all of the pattern and color options out there, it can still be tough landing on the right one for your space. Our favorite trick is to gather photos of your favorite options – whether it’s pics that you snap in the store or ones that you find online – and then scroll through them on the phone, quickly at first and then again more slowly. You can even pin them all to a Pinterest board and look at them collectively. We find that we often notice things in pictures that we sometimes miss in person – like the way two options have similar borders, or how one seems much duller than the others, or how the scale of one feels a little off. These distinctions or similarities might highlight a sometimes subconscious preference for a certain design, or eliminate an option that stands out in a bad way. So the photo trick is always our go-to way to double-check a rug decision. We prefer to purchase 100% natural material rugs – like thick 100% wool rugs (so plush!) or 100% cotton flat weaves (plus rug pad!). We also like natural fiber rugs, like the sisal runner in our kitchen (which is backed with rubber to keep it from slipping around). 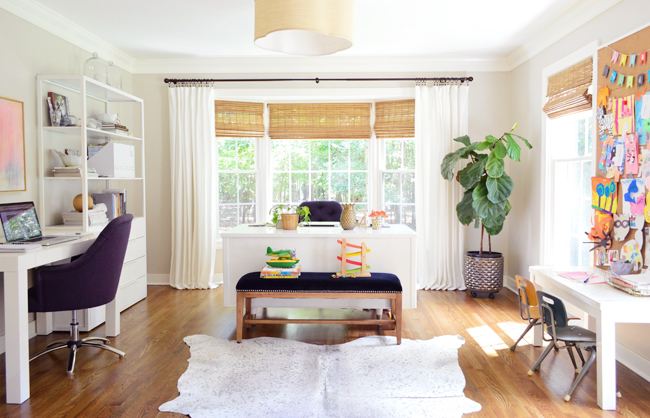 Basically, we try to avoid rugs that are a mix of multiple materials – like 90% one fiber, and 10% another. Why? We’ve had them and they just haven’t held up as well (we’ve had various issues with fading, staining, and sometimes even unravelling). We read a few articles about rug materials and a mixture of fibers is usually a sign they’re made from lower quality materials (like olefin, acrylic, polypropeline, etc) which may not feel as nice underfoot and may not wear as well over time. Those options can be good budget-saving choices, but unless we need an indoor/outdoor rug, we try to stick to natural materials these days. Our preference for natural materials is two-fold. 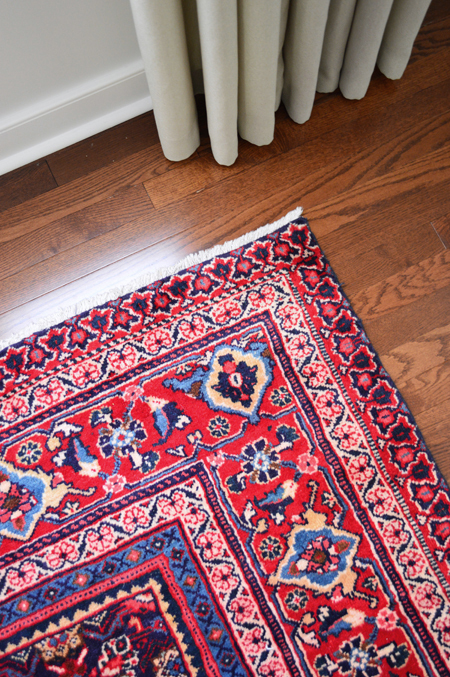 The first reason is the overall feel of the rug: wool is so plush, cotton is soft (and can even be machine washable in some cases) and even the right jute can feel nice underfoot (our kitchen runner isn’t scratchy at all). The second is durability and longevity. These materials are made for the long haul (in fact our three wool Persian and Turkish rugs are antiques, so they have been around for decades and are still going strong!) and their fibers are also great for keeping clean. I’m probably jinxing myself for saying this, but we haven’t had a single stain that we couldn’t remove from a wool, cotton, or jute rug in our house (including Sharpie!- more that below). It’s why we don’t sweat having our most expensive wool rug in a food-heavy room like the dining room, where wayward meatballs abound. The way we maintain and clean our cotton and wool is pretty much the same. We vacuum them regularly, and in the case that we’ve spilled something, we just spot clean with a ton of water (dabbing to lift the water along with whatever has spilled). And if we need to we’ll reach for some very mild soap like Dr. Bronners or Mrs. Meyers. So far – *knock on wood* – this has removed every single type of stain (marinara, wine, jelly, you name it!). And of course if it’s just our sisal runner in the kitchen we’ve been known to shake it outside, hose down any spots on it, and just let it air dry in the sun out there before bringing it back in. So easy. I’ve also successfully used a stain-lifting Tide pen on this rug after a certain marker incident that shall not be named. I was shocked, but it looks just as good as when we bought it. Came right out. There are seemingly endless sources for rugs these days – boutiques, online discount sites, decor retailers, big box stores, even places like Etsy (look how cool some of these are!). 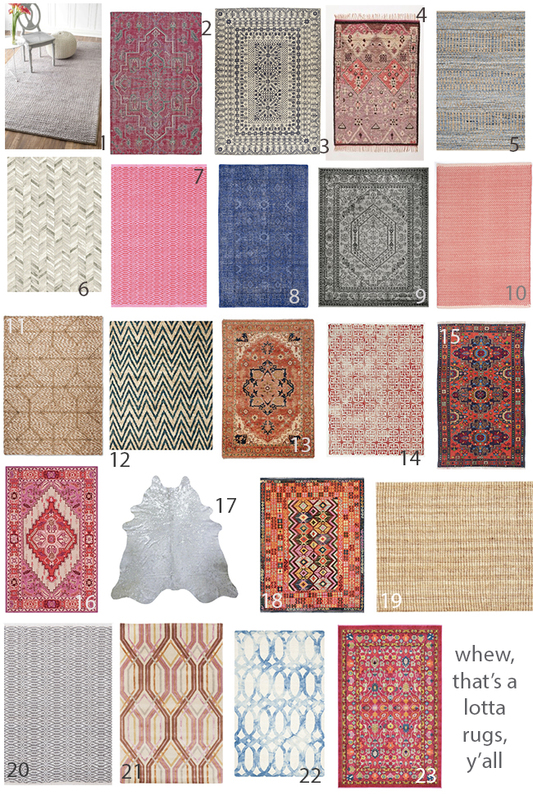 Having so many rug sources is a GREAT thing – because we try not to buy them from just one source because it could lead to our house looking “one note” or like we just recreated a store’s catalog in our home. 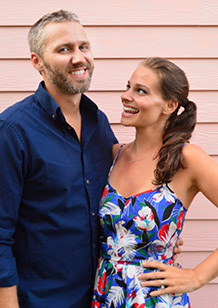 But it can be overwhelming, so we’ll recap where WE personally have had success over the years. 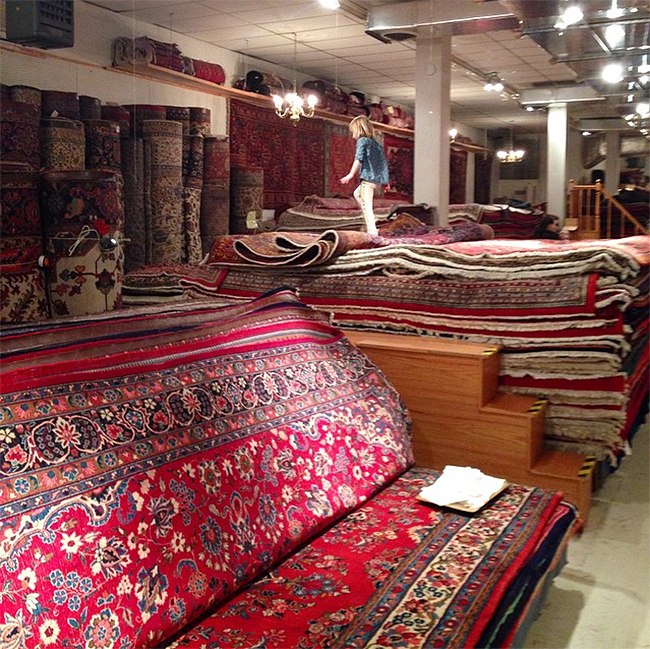 Lately, our go-to shop for traditional rugs has been a local place a friend suggested called Amir Rugs. You might find something similiar by searching: traditional Turkish Persian rugs _______ (put your city in that blank spot). Amir has TONS of rug types and sizes and some pretty great prices if you dig around a bit. We typically just walk in, tell them the size range we want (they have a lot of non-standard sizes), immediately mention our budget (so they’re not showing us things that are out of our range), and they lead us to a pile or two to flip through. The piles are sometimes so high that you have to use this special flight of stairs on wheels that lets you view the pattern from overhead. It takes two guys to flip back rug after rug until we see one that grabs our eye – at which point we snap a picture and keep flipping. After we get through all of the in-our-budget-and-size-range piles, we review everything on our phone that we liked and snapped a picture of, and then we pick our favorite and pull it out. 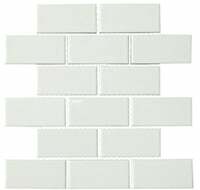 They’ll even let us take our favorite contender home overnight to see it in the space (an option that spared us from an ill-fitting purchase for our guest room, but cemented the choices for our living room, dining room, and bonus room). 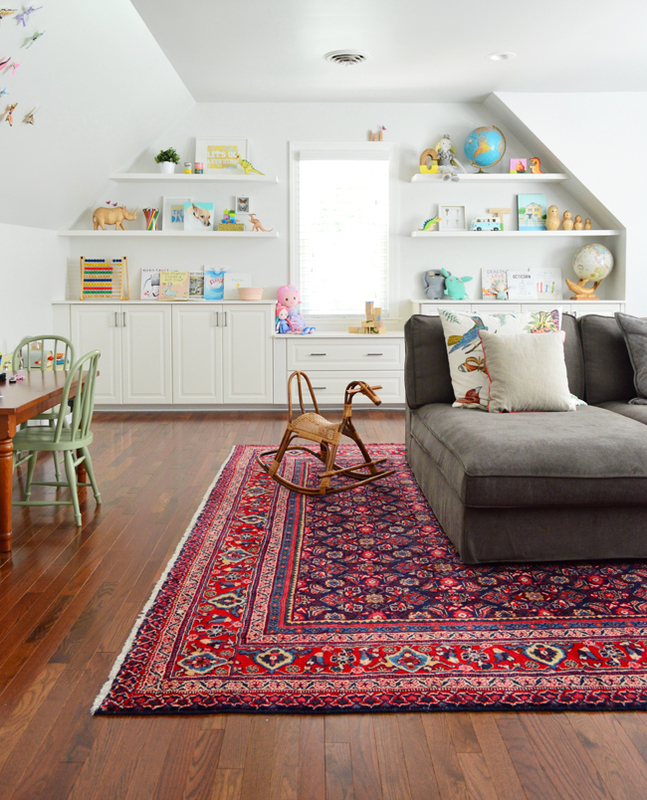 If you can’t find a similar shop in your own town, we’ve linked some of our favorite traditional rugs below – or just ask around to see if there’s someone in your area who does the same thing. 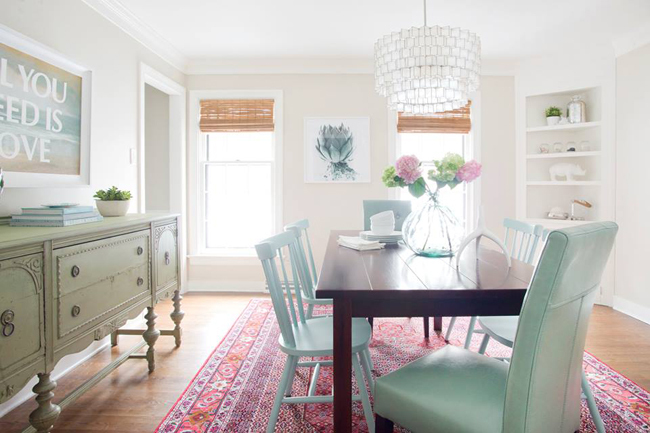 There are tons of other places we hunt for rugs, both locally and online. Although we prefer to see rugs in person whenever possible, since the whole feeling and thickness thing are often important factors, which are hard to gauge from your computer screen. But we’ve had good luck everywhere from West Elm, Ballard Designs, Dash & Albert and Pottery Barn to Wayfair, Overstock, Joss & Main, and – one of our favorites – HomeGoods. 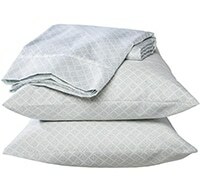 HomeGoods is especially great if you want a bargain, need a fairly standard size, and have the time to hunt across a few weeks (there are two in our town, and it might mean hitting them each up once a week for a few weeks, but you can often save a few hundred bucks that way). Big rugs often mean bigger bucks, so it’s not unheard of for someone to spend $2000 (or more!) on an 8 x 10′ or larger wool rug. For the last few years our goal has been to buy it well, so we only have to buy it once. No more cheaping out on something that fills the space “for now” or, heck, doesn’t even literally fill the space properly. So we’ve been more willing to spend more for a design and a material that we love that will last us for the long haul (no settling allowed! and no grabbing something just because it’s cheap!). 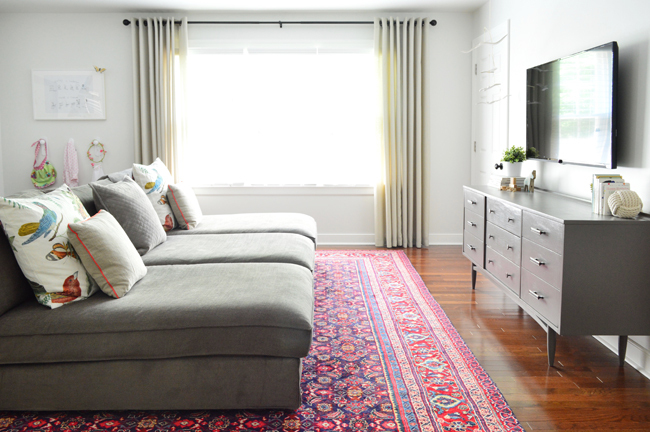 We’re fortunate that by having bought our big traditional rugs at a local shop, where we could negotiate, we were able to get our three for around $900 each (and our bonus room and living room rugs are both 10 x 14′!). Certainly not a drop in the bucket, but considering how much we LOVE them and how long they’re expected to hold up, I wouldn’t have been mad to spend twice that. 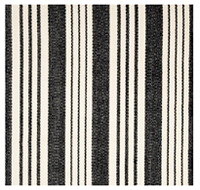 I’m cheap so I’m wincing as I type that, but these rugs are GOOD, and we have seen them with $3K+ price tags on them at this size. I think after years of owning them and being happy with them and realizing they’re completely worth the hunt and the money, we’re slightly less reluctant to hand over our Benjamins on a rug if it saves us from rebuying for a room on repeat. We have been here almost four years and every single rug we have bought since moving in has stayed and is still in use… which is pretty much a record for us! And the old “mistake” rugs from our first and second houses have served their purpose by teaching us what we don’t love as much and by being something to craigslist so we could put that money towards a few rugs we like a lot more. But being willing to spend more, doesn’t mean we don’t still seek a deal. So if you can, negotiate! My number one tip is to nicely ask “Is that your best price?” Then just wait. Resist the urge to undercut yourself and say “I mean it’s so beautiful so no worries if you can’t come down” (every inch of me hates the wait and always wants to fill that space with SO MANY WORDS, but trust me, just smile and wait). Usually what happens is that if the price is flexible, you’ll score a nice discount (we’ve saved as much as $200 off, just by asking!). You can also plead your case by reminding the person if you’ve already purchased other things from them (for example when we bought our third rug from Amir Rugs, we reminded the salesman that we had purchased two other rugs from him already). It never hurts to ask! When negotiating isn’t an option (like when ordering online for example), we always like to search for a discount code, and check out the home page to see if there are any specials going on (like “10% off when you spend $200 or more” etc). 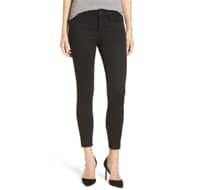 Or if you’re in a larger store like West Elm or Pottery Barn, just ask the salesperson if there are any sales or coupons available (sometimes they have one on hand they’re happy to scan for you). Another easy online trick is to Google the name of the rug to see if the same item pops up more affordably somewhere else (even if it’s just because another site offers cheaper or even free shipping). 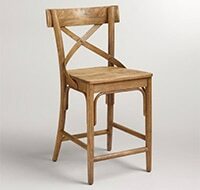 Unless you’re buying an exclusive design like those found at Pottery Barn, Anthropologie, or a similar store – it’s likely that places like Overstock, Wayfair, or even Amazon all carry the same item under the same name (this is also a great way to read more reviews if you want to boost your confidence in a purchase before going for it). 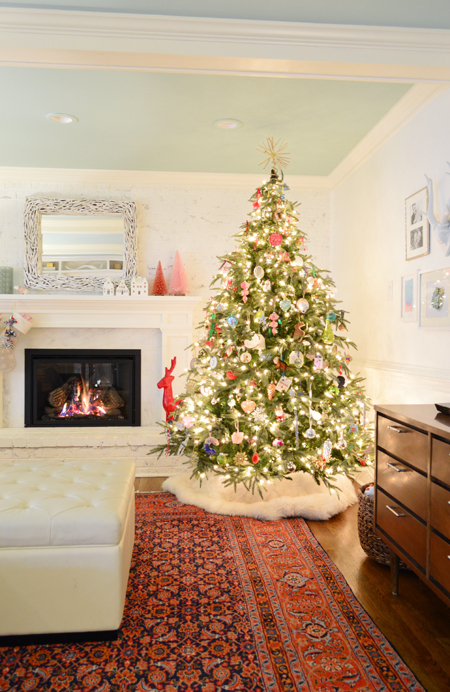 We also get questions about rugs over carpeting, and we’re firmly in the camp of YES! 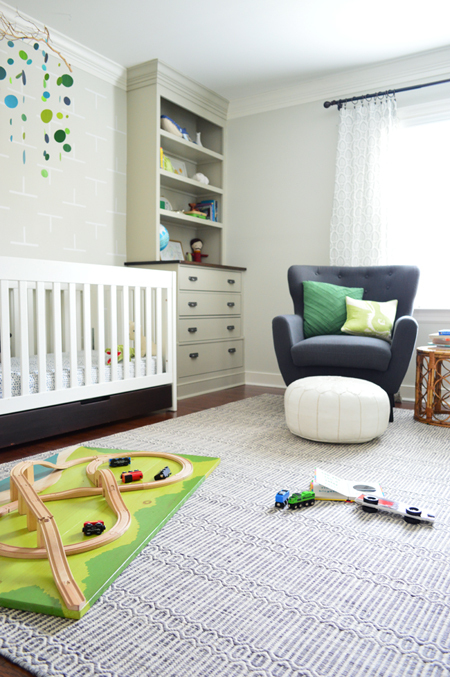 Take Hudson’s bedroom which had existing cream colored wall to wall carpeting. 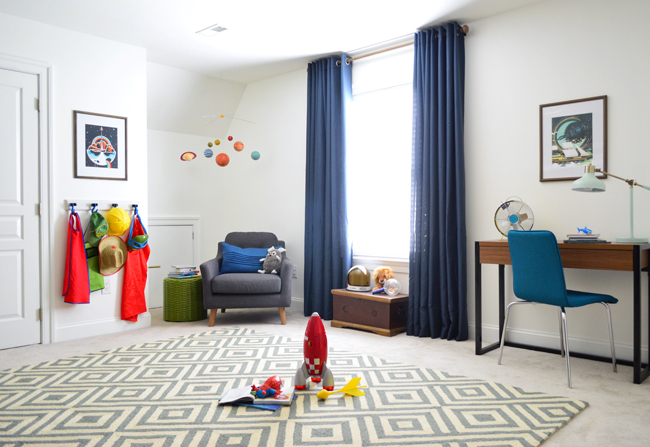 We chose a light 8 x 10′ patterned cream and blue rug that blended nicely with the existing carpeting and laid it right on top to add some extra interest (and to cut that big expanse of plain cream color that used to be going on in the center of the room). It definitely made the room feel more playful and added some nice texture and color. But we didn’t get it right on the first try! We originally had purchased a super bold green and blue patterned rug for this space, but only after rolling it out did we realize that it didn’t blend as seamlessly into the existing carpet (it really called attention to the “island” floating in the middle of the room due to the bold color). 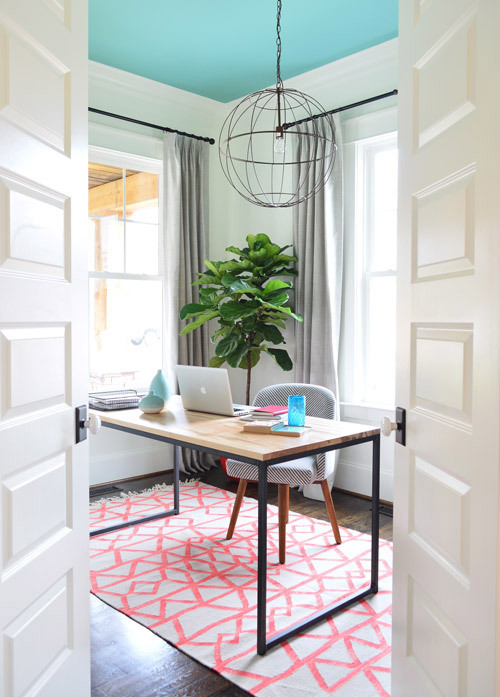 That taught us that sometimes when you’re going over an existing carpet, it’s smart to choose something that blends nicely with the background – especially if you want to help the room feel expansive and open instead of boxy and chopped up. And because rugs are so deliriously complicated, it should come as no surprise that we’ve actually talked about them at length on our podcast too. So for anyone who wants even more rug tips & tricks, here’s a podcast (Episode #5) all about the rug crime we had been unknowingly committing for years. Fast-forward to 9-minutes if you wanna dive right into the rug part (which is kicked off by Jonathan Adler!). Note: These players don’t always show up in feed readers, so click through to the post if you can’t see it. And here’s another podcast (Episode #12) full of five rug tips for getting it right on the first try (many of which haven’t even been touched on here). The rug talk starts at the 8-minute mark. Oh, and if you stick around to 27:30, Jenni Pulos from Bravo’s Flipping Out also makes up a rap about us… and I fail miserably at beat-boxing. If there’s just an empty box below, click through to the original post for the player. Psst. If you’re looking for paint colors & sources for all of the furniture/accessories in our house, this page has those deets.